Or….should I say how I plan to spend my summer vacation. It seems that the stars have aligned and I have a delicious window of time to spend time in my studio. 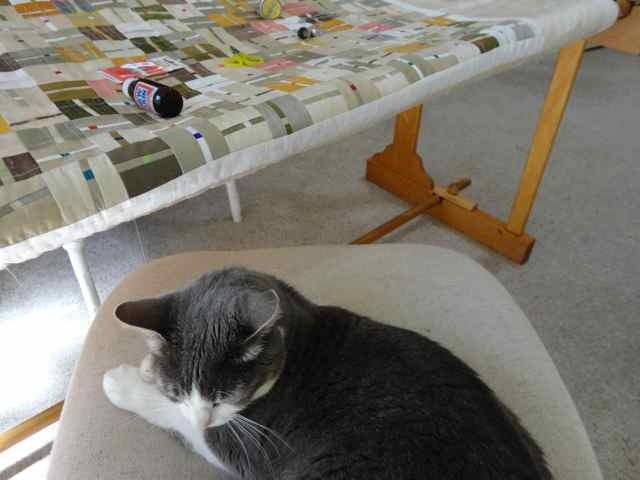 It has been forever and a day that I have had quilt top calling for an opportunity to lavish on my frame. Well, here she is (and yes, it’s a girl) and she is whispering sweet nothings in my ear…..gotta run! 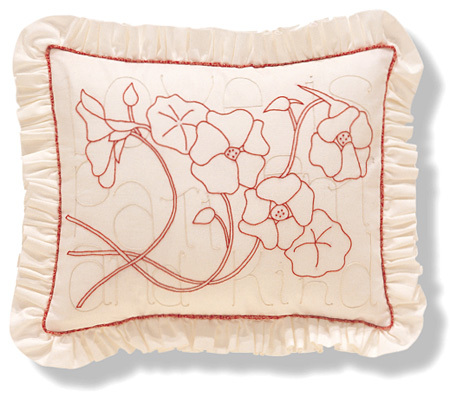 I love traveling for Bernina of America. 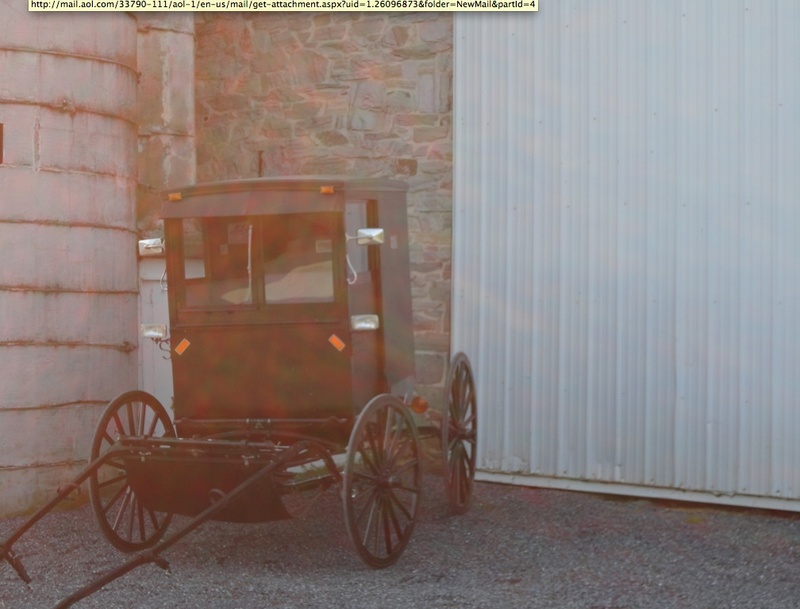 This past week I had the honor of visiting Hinkletown and Hoovers Bernina in PA. This time I was asked to teach both machine applique (which I have fallen seriously in love with) and piecing. With technology under my belt (sort of) we presented via camera, projector and screen. Other than a projector on the fritz for one session, it was great! 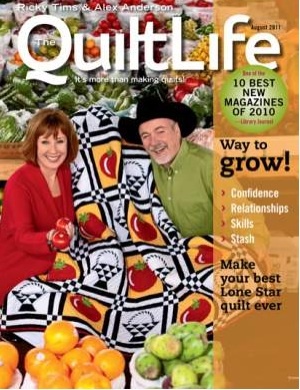 Imagine a room full of quilting enthusiasts – hundreds to be exact! What struck me is that we are all on a similar journey as we continue to learn and grow as together. What other “sport” can boast this quality? Also, What is so amazing when I attend events is that as I look to the audience along with meet and greets, so many of you I have had the pleasure of meeting before – Super cool! 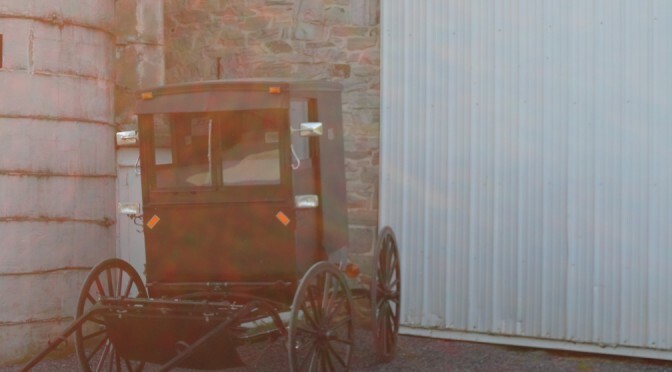 If you have never had the opportunity to visit the PA area, this is bucket list and if you have, I am sure you will agree. 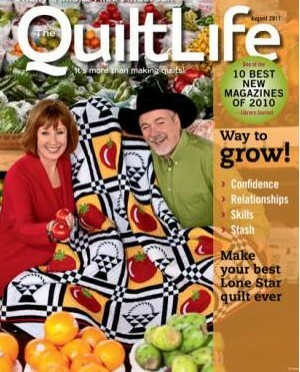 The Quilt Life Magazine Scores Big! WOW – SUPER COOL BEANS – Get your subscription today! Welcome to my new personal playground! I’m very excited about my updated site, as it gives me the ability to make changes with just the click of the mouse. In celebration, I’m offering you a free pattern-one of my favorites-from my book, Shadow Redwork. To download your free pattern, simply click here. To order an autographed copy of Shadow Redwork, click here. In light of the tragedy that has devastated Japan, we felt moved to contribute with the work of Alex’s hands and the gift of learning from Ricky. Together we can make a difference for the people of Japan who have suffered so greatly. Let’s celebrate the ability to help those in need TQS style. Show your support to the victims of the Japan earthquake and tsunami by entering now to be eligible to win two great prizes for one lucky person. Enter now to be eligible to win Bridge of Life, a quilt designed, pieced and appliqued by Alex Anderson, border by Gloria Smith and machine quilted by Paula Reid. This quilt has debuted in two books — Sew with the Stars (P&B Textiles) and Alex Anderson’s Machine and Hand Applique (C&T Publishing). 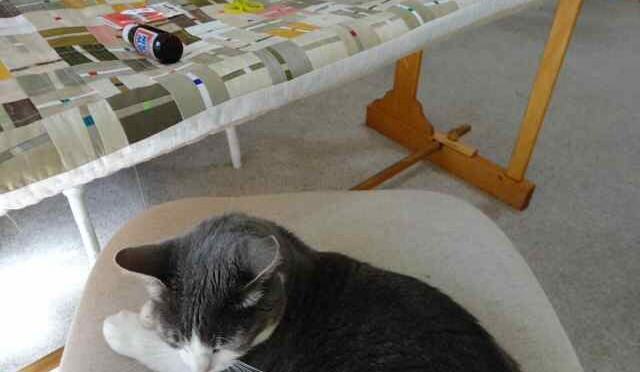 This quilt will continue her journey by helping people in need. 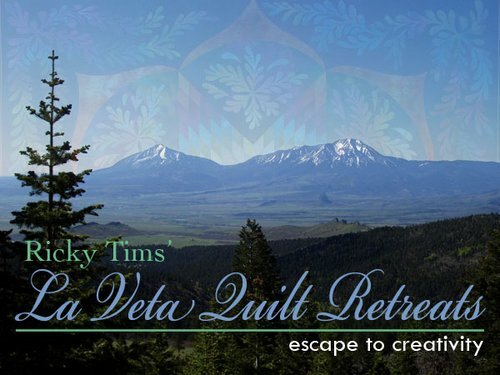 Ricky has graciously offered one free tuition to a Ricky Tims Retreat in La Veta, CO, sometime in 2012. During this five day, ten-person retreat you will have the opportunity to study in an incredibly special environment with Ricky and foster your creative spirit. TQS is sweetening the pot by throwing in $500.00 to help with transportation and lodging (to be reimbursed at the retreat). Please, be Someone’s Angel in Japan. It is really quite easy to contribute. Simply fill out the following form, then click continue. You will then be provided with a page to print and mail directly to Alex (mailing address on next page). Please send this in with a check or money order made to the Red Cross Disaster Relief / memo: Japan (it is tax deductible). The amount is up to you and we encourage you to be generous. The donations will be delivered weekly to the Red Cross. Thank you so much for participating with this important effort. Note: International donors can contribute in their local currency. The drawing will be held late April and the winner will be contacted and announced thereafter. Alex and Ricky are very excited about letting go of one Alex’s favorite “babies” and are also super pleased that one of you will be joining Ricky in La Veta for this important effort in lending a helping hand and as an expression of support and deep concern for our brothers and sisters in need. 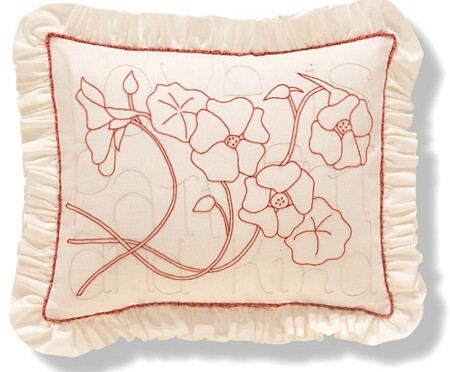 Speaking of Red Work – Please join me at my Quilting in the Garden’s (this years featured guests are Rob Appell and Verna Mosquera – September 24 & 25) pre-class on Sept. 22. It is a pleasure to teach a hands on workshop in this incredible environment. 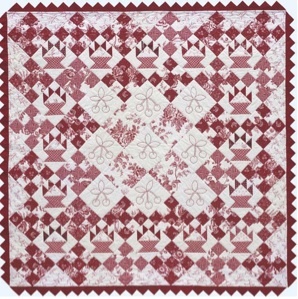 In this class you will learn efficient piecing techniques , red work embroidery and prairie points while starting this delightful quilt. Please call Alden Lane in Livermore, Ca. to secure your spot – 925-447-0280. 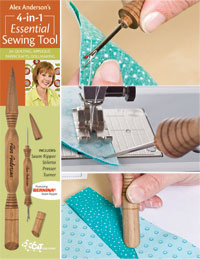 The Alex Anderson 4 in 1 tool is here – Get yours now! Won’t roll off your work surface! View details or purchase now!